Photographs are flat representations of the three-dimensional world. They freeze a moment in time, and capture a specific place, activity, person or group of people. Much of my sculpture in the past decade uses photographs as its referential subject. Starting with archival photographs taken on Governors Island in New York Harbor during the time it was active military encampment, and photographs from Weir Farm in Connecticut, and family photographs, I explored how the past and the present intertwine. In these relief carvings, I return black and white photographs to three dimensions. Some recent pieces are specific explorations of changes visible over time, as those changes become apparent in image series. My most recent sculptures reference travel and the frozen moments one captures moving through landscapes and cityscapes. In a two step process, I begin by taking hundreds of pictures and then curating them into a story in images. 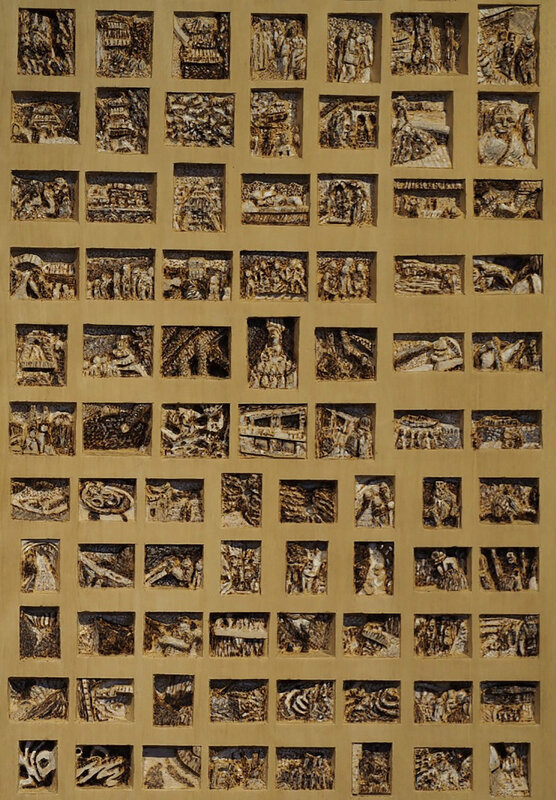 These images are then returned to three dimensions in carved collages. The pieces are carved, burned, and painted to suggest their sources -- black and white photographs – but they are not reproductions. Through this transformation, the photographs become more abstract, and hopefully thereby, more universal. They are softer edged, more like memories than decipherable events. All of the sculptures I have created working this way are wall pieces. There are smaller ones, some as small as10-12 inches tall, and larger ones, including some that are 5-6 feet long . Working with different scales is another way to upend the original intention of the photos. These are not film strips or digital documentaries. They reimagine the fixity or flexibility of time by swapping the original medium for wood, and then reimagining the images themselves into more elemental forms.